Was it State of Origin fever or Saturday Night Fever that inspired the South Australians to unleash this new uniform on an unsuspecting football public in 1979? The new look was first unveiled on May 21st, 1979 at Football Park for South Australia's clash against Victoria and judging by the match review in the 1979-80 VFL Yearbook, the Victorians were underwhelmed by their arch-rival's new look: "[The South Australians'] performance was equally as unimpressive as their newly-designed guernseys - not nearly as prominent as the red, gold and navy blue of past years." 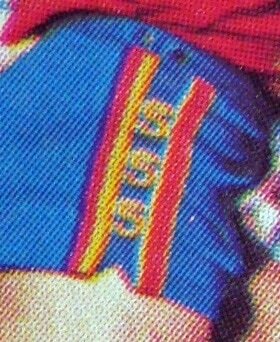 The shorts on this uniform featured a gold stripe down the front edge and a red stripe along the rear edge (see image at right). The 1979 version of the uniform featured the new SANFL logo first worn in 1977. 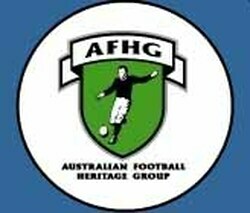 In 1980 this was replaced by the classic SANFL logo that remains in use today. 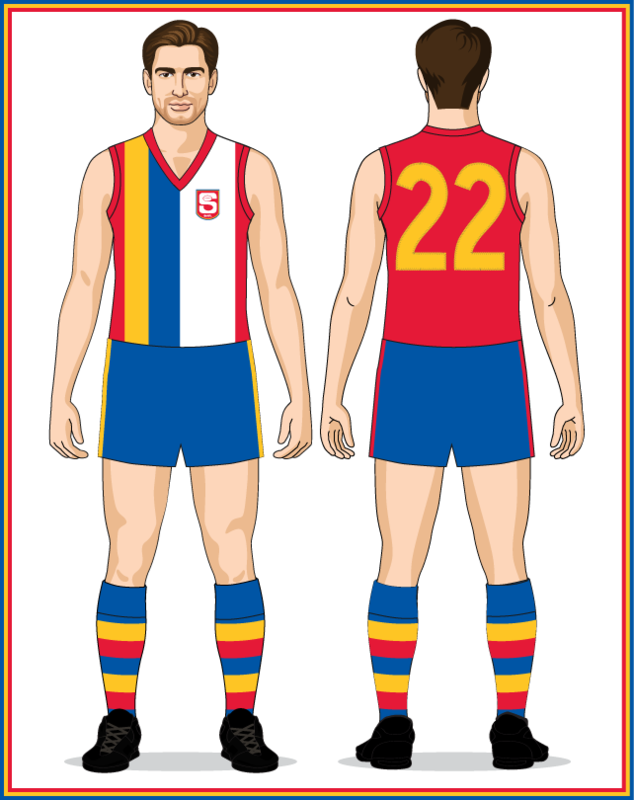 From 1981 the new SANFL logo also appeared on the bottom right-hand side of the shorts. The design along the side of the shorts changed from the two simple stripes of 1979-80 to a new design that incorporated the SANFL's "S" logo (see image at right). By 1986 South Australia's garish disco design was looking dated and a replacement was required. For their new look the South Australians delved into their past, creating a uniform inspired by the designs worn from 1936 to 1978. The differences were royal blue instead of the traditional navy blue, red socks instead of red with navy blue tops, and modified vees that had a rounded base and finished higher on the jumper than before. The year 1986 was also the 150th anniversary of the formation of South Australia as a Colony/State. To mark the occasion the South Australian team wore a one-off patch featuring the official SA 150 logo. This is the classic State of Origin design that most modern football fans associate with South Australia and interstate football. In 1986 Victoria (Carlton Draught) became the first of the big three States to wear a sponsor patch on their interstate jumper. Western Australia (SGIO) followed suit in 1988 and in 1990 the SANFL finally broke with tradition when the West End patch appeared for the first time. West End were the first, and to date, only company to sponsor the South Australian team. The longevity of this deal is only surpassed in Australian football by Geelong's long-running jumper sponsorship deal with Ford which has remained in place since 1977. In 1993 West End launched a new brand of beer named "Eagle Super". To help promote their new product the West End patch was replaced by the Eagle Super logo on the front of the jumper. By 1993 the AFL's national competition had swamped the previously top-level State leagues. In 1991-92 the SANFL representative team and the South Australian AFL State of Origin team had continued to wear identical uniforms but 1993 marked the first season separate uniforms were worn. The representative team (shown above left) wore the standard State uniform while the origin team (shown above right) added a 1993 AFL State of Origin patch, pushing the SANFL logo higher on the jumper front. A similar attempt to differentiate between the State League representative and State of Origin teams had first occurred in Western Australia in 1992. - a return to the standard West End sponsor patch previously worn 1990-92. 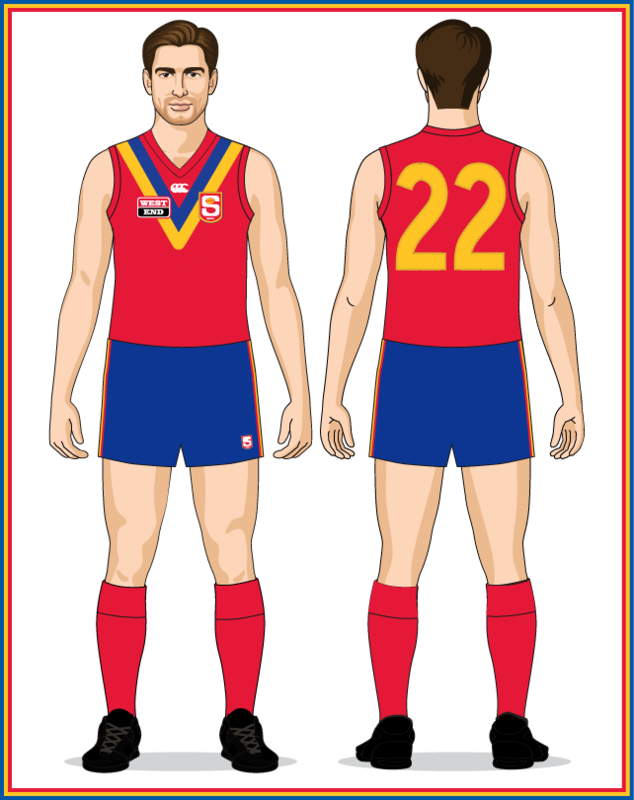 - the SANFL logo worn since 1980 was tweaked; the football in the top half of the "S" changing from white to gold. An AFL State of Origin patch was again added to the front of the South Australian jumper to differentiate it from the SANFL representative uniform. The first straight vees since the 1947-55 State jumper and the AFL State of Origin patch was worn at the base of the vees for the first time (allowing the SANFL logo to return to it's normal position). The jumper worn by the SANFL representative team against the TFL had no State of Origin patch and featured the logo of the team's apparel sponsor, Canterbury. - the vees were thinner and extended much further down the jumper than in previous seasons. - the jumper worn by the SANFL representative team again featured a Canterbury logo instead of an AFL State of Origin patch. The AFL State of Origin patch moved lower on the jumper so that the base of the gold V was again visible. Unlike the 1995-96 representative jumpers which simply substituted the State of Origin patch for the apparel sponsor's logo, this 1997 jumper worn by the SANFL representative team featured the Canterbury logo in a different position (within instead of below the vees). - the West End patch was noticeably smaller on this jumper. made its way onto the State jumper as well. For the match against Western Australia an AFL State of Origin patch was added to the base of the vees. - the Canterbury apparel sponsor logo moved from above the vees to within the blue vee. - for the match against Victoria an AFL State of Origin patch was added to the base of the vees.